I didn’t read much in May, so I thought that I would combine with June . . . but June is shaping up to be the fullest reading (or completion) month yet, so I will combine May books and movies. The Song of Glory and Ghost (second book in Outlaws of Time series) by N.D. Wilson. Interesting, I suppose. The plot dragged in the first book, and sped up unbelievably for this one. I prefer his stand-alone books and his first trilogy to his more recent series (and I’m still waiting for the end of Ashtown Burials; the last book left with a whole new can of worms opened). Seeking Allah, Finding Jesus: A Devout Muslim Encounters Christianity by Nabeel Qureshi. I greatly enjoyed this, but I do think it is kind of misleading. He comes from a privileged, sheltered background and learned from those who cherry picked their doctrines, history, and teaching or from those who learned from those. He points this out, but I still feel that he is trying to translate his experience to far, even for a Western Muslim, he certainly goes too far to include Muslim and Muslim majority countries. I think it’s a good starting point for learning about Islam and Islamic apologetics if you read critically and intend to study further. From Pride to Humility: A Biblical Perspective by Stuart Scott. I finally read this booklet Mom gave me. I often have used scraps of paper for bookmarks, but I’ve gotten better with using bookmarks of late. I had a bookmark from a birthday card from my parents that had sweet words (like favorite things or something) on it and was pink with a pink ribbon. I didn’t think to laminate it to preserve it, and so I wore it out, and instead of ending my stupidity there, I think I threw it out instead of putting it in a scrapbook. Sometimes I really want to go back in time and slap myself hard. 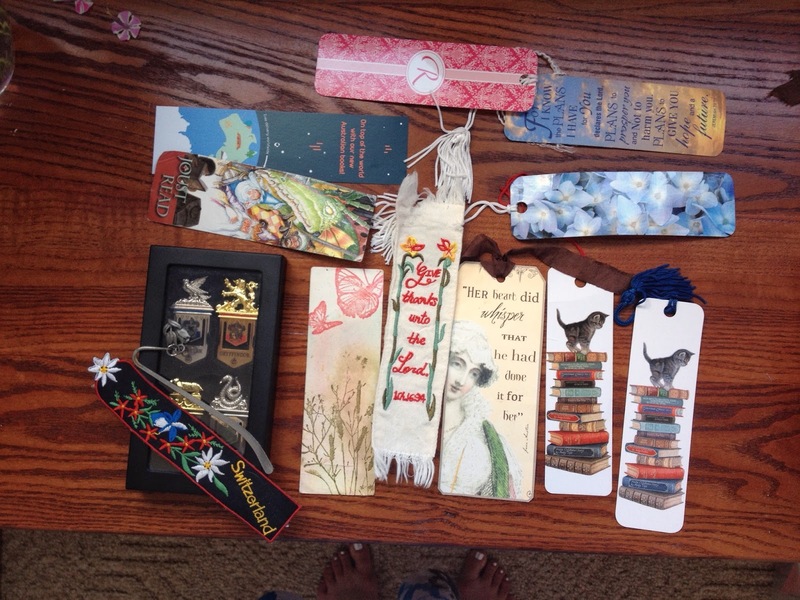 My bookmark collection (I have three more of the Jane Austen quote set; I won them in a giveaway). The Harry Potter ones I haven’t used; I like them for decorative purposes. I’ve had the Switzerland one for probably a decade and a half (my grandmother went on a Beth Moore trip there), and I’ve had the metal one probably almost as long. The two on the top left I’ve found in books I’ve bought or library books. I intentionally got the two cat ones because I just love that art (I also have the greeting card set). Oh, and more on my blonde-ness. I’ve discovered “stats” on Goodreads. I’ve been on there 8 years, people. When I found a stats page via Google, I didn’t realize it was something always on my home-page; what an idiot. Anyway, I LOVE this. I can look at what I’ve read year by year in total books and pages and see what the longest book for each year was, and I can see what proportion of books from different shelves and see the number of books by my rating. Goldmine. Rogue One. The horrible pragmatic (which doesn’t work) “ends justify the means” worldview that pervades the rebel forces ruins this as a good movie for me. The plot and acting are considerably better than the previous Star Wars movie. Why couldn’t the morality be? Especially because I like Cassian (whose morality is the most, um, questionable). An American in Paris. Boring. I skipped a lot of this, mostly songs. Song of the Thin Man. This is a much lighter version (although, it is still a murder mystery with more than one murder, though not NEAR as many as the first). My sister who hadn’t seen the first one now wants to see more these. Two of my sisters also started watching (and re-watching) all the Star Wars movies in order (except Rogue One) at the end of May through the beginning of June. I’d seen IV and V over a decade ago (I think I was grounded or something when the rest of the family watched the VI, lol). I watched II a couple years after that and then VI several years after that. Then I watched the newest shortly after it came out. The two younger girls hadn’t seen I-III, I think. We laughed and mocked the films quite a bit. We decided we still didn’t “get” the Star Wars fandom, but we thought the movies were fun. I’m not sure I’d waste much time re-watching them, especially not the first episodes.